The cadre management of an all-India Service like the Indian Police Service and the placement and postings of top-most and senior officials belonging to this elite service leaves much to be desired in Madhya Pradesh. Shortly before this, a brilliant and committed 1984 batch IPS officer like Maithili Sharan Gupta was abruptly removed from the post of DG Home Guards and posted in the Police Headquarters here as Special DG Police Reforms – a post without any mandate. Inquiries have revealed that the work relating to the compliance with the order of the Supreme Court and its directives to the State Governments and Union Territories in 2006 to initiate Police reforms has not been entrusted to this office. At present this office is neither involved in steps to introduce the Police Commissioner system in big cities nor in giving final touches to the new Police Act. Recently, a rumour had been spread that all Home Guards who had attained the age of 41 years were being summarily discharged at the initiative of Maithili Sharan Gupta, in his capacity as the then DG Home Guards. To counter this, Gupta even had to convene a “Sainik Sammelan (convention of Home Guard volunteers) to dispel their doubts. The malicious campaign against the then DG Home Guards was carried out vigorously even by a section of the media that projected without verifying facts that he was bent upon retiring all the Home Guards who had attained the age of 41 years. 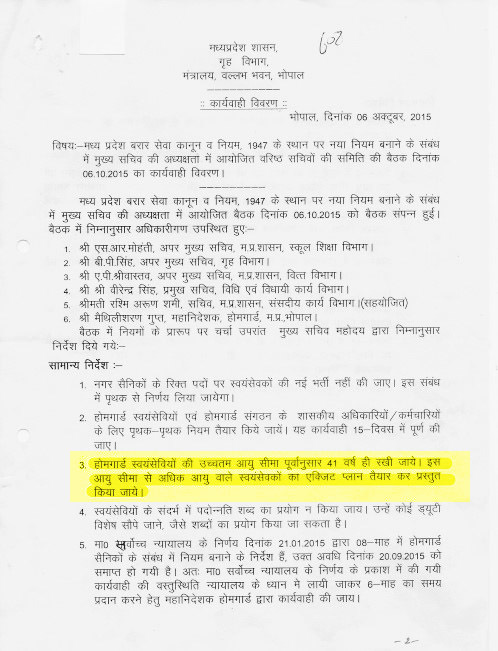 A committee of secretaries headed by Madhya Pradesh Chief Secretary Anthony J.C. de Sa on 6 October 2015, had rejected the recommendation of a high powered committee of officials to raise the retirement age of Home Guards to 50 years and had ordered that their age of retirement should be 41 years. This was contrary to the fact as in his capacity as DG Home Guards, Gupta had recommended extension of retirement age from 41 years to 50 years with the provision of retain existing Home Guards up to the age of 60 years. The fact of the case is that the decision was taken by a committee of officers headed by the Chief Secretary to retain the age of 41 years as the retirement age of Home Guards. This committee had also rejected the proposal to retain the serving Home Guards up to the age of 60 years. 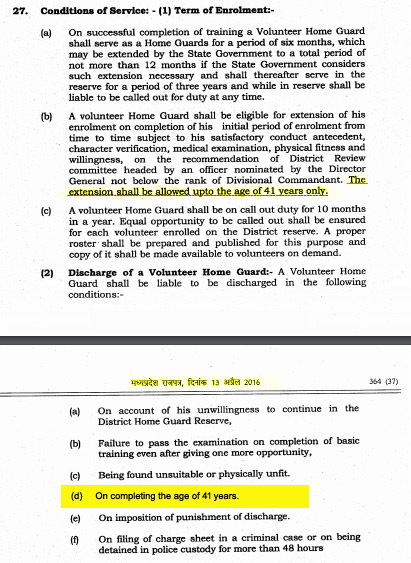 When Gupta took over as the head of Madhya Pardesh Home Guards, the retirement age of the Home Guard volunteers as per the Central Province (CP) and Barar Home Guards Rules 1947 (adopted by M.P. in 1956) was 41 years. A Committee headed by K. Suresh Principal Secretary GAD, who has since retired from service, with the DGP Home Guard, Home Secy & ACG HG as members, was nominated to frame New Home Guard rules under the direction of the Supreme Court of India. This committee, on 24 August 2015, recommended 50 years as retirement age for Home Guards also that a volunteer enrolled prior to the coming into effect of the new rules shall be eligible, subject to certain conditions, for extension in enrolment from time to time up to attaining the age of 60 years. The State Government, on 28 July 2016, also directed in writing that maximum age of 41 years be achieved within a fixed time-frame and the senior-most home guards be phased out in two years. Gupta’s initiative as Madhya Pradesh GRP chief in early 2015 had led to the successful introduction of the national version of GRP HELP App, which is a mobile based application for use by railway passengers to report crime, presence of suspicious persons on train and feedback in GRP, RPF and Railway staff to improve their performance. The GRP App was developed as a facility with seamless connectivity across the country using the radio-internet network to help forward SMS messages to the central information system even from places lacking internet connectivity. This App has been designed to serve multiple functions ranging from onboard recording of complaints by railway passengers to registration of FIRs and state-of-the-art investigation aided by immediate access to criminal data base. During Gupta’s tenure as DG Home Guards, all concerned have lavishly praised the arrangements and the role played by the Home Guards in monitoring and ensuring the smooth flow of pilgrims and guaranteeing their round-the-clock safety during the Simhastha Festival at Ujjain earlier this year. Gupta was in the forefront defending the nation from infiltrators from across the border in his capacity as the Chief of Central Reserve POlice Force (CRPF) operations in Kashmir (2007-2008). As IG Special Task Force in Madhya Pradsh (2009-2010), Gupta was chief of investigations and operations against organised crime, Anti-Terrorist Squad (ATS), Centre Terrorist Group (CTG), Hawk force (Special Anti-Naxalite Operation Force and was responsible for coordination of Anti-Naxalite operations in the State. Postscript: Many Senior officers belonging to the IPS and also the Indian Forest Service when contacted were unanimous in pointing out that a few top bureaucrats who are close to Chief Minister Shivraj Singh Chouhan are keeping their political master in the dark about so many crucial issues. Few top officers, both serving and retired reflected their seething discontent by pointing out that despite their best efforts they have failed to meet the chief minister to present the objective and correct picture.